Hot on the heels of reports that the FCC would approve the T-Mobile merger at the bureau level and not a full vote — comes exactly that result. The flash just hit Bloomberg News, leaving any remaining obstacles to the merger to come from the MetroPCS shareholder meeting in April. Based on the record before us and our review of the competitive effects of the proposed transaction, we find that approval of the transaction will serve the public interest. In considering the applications before us, we evaluate the likely competitive effects of the proposed transaction at both the local and national levels. The proposed transaction raises horizontal competition issues because it would result in the combination of overlapping mobile wireless coverage and services in various markets, as well as the transfer of customers of two current competitors to the newly combined entity, referred to by the Applicants as “Newco.”2 On these issues, we find that the transaction is not likely to result generally in competitive or other public interest harms. In addition, to the extent there may be some possible competitive harms in selected geographic areas, we find that these possible competitive harms are outweighed by certain public interest benefits likely to result from the proposed transaction. Such benefits include the facilitation of Long Term Evolution (“LTE”) deployment, the expansion of the MetroPCS brand into new geographical markets, the development of a more robust, national network, improved quality of service, and the strengthening of the fourth largest nationwide service provider’s ability to compete in the mobile broadband services market. In summary, we find that any potential public interest harms would be outweighed by the resulting public interest benefits and we conclude that, on balance, the transaction is in the public interest. Accordingly, we approve it for the reasons discussed below. actually in some places it would benefit T-Mobile. Here around Fort Lauderdale when you look on RootMetrics app, Metropcs has the best signal (all green). Great job now let’s get busy. 2013 has so much to accomplish. Typical dopey squiddy he is exactly what he’s always been. Meanwhile off to unpacked event sitting here three blocks from Radio City Music Hall right now. Samsung starting to set up shop as a write this from my Galaxy Note 2. Got much important things to focus on these next three days. Life is real good. Well I’m here in Miami Richard and I will be watching via online as will everyone else here even some iPhone fanboys..LOL. Can’t blame you. It’s a great watch even if you don’t like Samsung as far as product purchases. They put on an excellent unpacked show every year. Stop tryna bring drama where it is completely unneeded. Take the high road. That guy that sides with you. Shortened version of “Trying To”. It’s “tryna”, not “tyrna” & it’s my own little contraction for “trying to”. I apologize that that went over your head. Apology accepted. I apologize for misspelling your own little word. I’m happy. Don’t see anything bad about it from my standpoint. Well, at least they didn’t require the combined entity shed spectrum where they have the same type in a market. That’s a first. Tried to tell you they wouldn’t. Metro was not a national carrier like Alltel and Tmo+Metro is still in 4th place. Tmo+metro would still be in 4th place with about 42 million subscribers. Sprint is 3rd with 56 million subscribers. Thanks for catching that. mistake on my part. Not sure why I put third place. Metro PCS management are big believers in offshore customer service. It’s well documented. T-Mobile has already been dabbing with terrible offshore CS for a while now. Hopefully the Metro team doesn’t encourage more offshore support in order to attain additional synergies. Gina, T-Mobile has pledged to have ALL 37,000 Towers refarmed to HSPA 42 by end of July. It is part of their Challenger Business Strategy. Goodbye America’s Largest 2G!! Hehe. Certainly hope that would be true. They have Edge everywhere I got outside the area I live in. And didn’t they say that they will keep te edge networke because they are some how making money from it away from customers? If anything they will have to cover EDGE with HSPA+ to stay competitive. Also hope that they can eventually introduce service to states where they don’t cover we’ll or at all….like Vermont. Right, they are keeping EDGE. Areas that are EDGE only now, will stay that way forever. The only areas getting 1900 HSPA and LTE are the ones that are already AWS HSPA. If you don’t have 3g now, you simply aren’t getting it, and you should switch to a carrier that does offer it where you are. They will upgrade the entire network. They will have to sooner or later. They will just put HSPA+ over it. Though EDGE will stay for a while. They hinted at refarming the 2G spectrum, so this way those areas that have been using EDGE for years, if you have the proper phone, you should experience, 4G connectivity. Also Tmobile does not have enough Spectrum in the PCS block to deploy nationwide HSPA42. No, they are only updating the towers that are already 3g to be on 1900 and then LTE. The places that are EDGE will remain on EDGE. So sorry!! In the second document, look at page 8 and 9. It shows that AWS spectrum will house LTE and HSPA+ (currently only HSPA+). THE PCS spectrum (probably from metro) and GSM will be (mostly) re-farmed to HSPA+. After re-farm, very little GSM (2G) will be remaining. Stop saying this. T-Mobile has a lot more than 37,000 towers – EDGE is not going away by summer. MetroPC is only in a few markets so a competitor is not really being eliminated. All it’s going to do is give TM a boost in their customer base, provided the customers choose to stay. It will also give them a boost on spectrum needed to make their LTE network better. You have not done your homework. This is Great news. Super excited!! I like it now Tmobile will get better services, more towers, good bye to metro. Now whats the next procedure? No, Jeremy is correct. 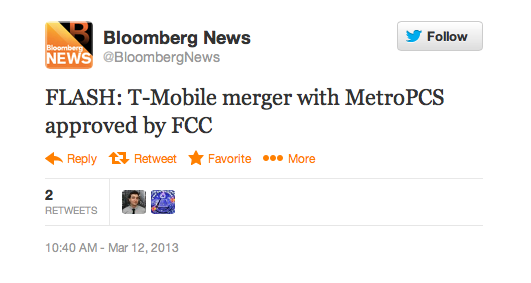 T-Mobile will slowly migrate Metro customer to their network but it will still be with Metro’s plans and branding. T-Mobile will likely sell/lease off any overlapping towers and possibly convert other ones where T-Mo doesn’t have coverage. So the DOJ doesn’t have to approve it? This definitely makes more sense than selling the company to att bolstering a duopoly. This also gives DT a chance to gracefully exit by selling shares if this new direction doesn’t work out. Either way Tmo is here to stay in the long term. what’s next after this? im happy that the fcc and the doj approve this but what’s next?